The perfect Christmas Cake, well this is a hard one! Why? because everyone’s Christmas is different, some people have recipes that have been in their family for generations. A bit like my mother-in- lawʼs Christmas pudding recipe and that is one of the reasons why I will never will take on the duty of Christmas pudding! Myself I donʼt actually eat the Christmas cake until Boxing Day, I find it too heavy after my favourite dinner of the year! On the big day itself I have been making soufflé for l8 years and this has become a bit of a burden. My wife and her annoying uncle (there is one in every family) expect a different flavour every year! Then there is the pressure, is this the year itʼs not going to rise! I think this is part of the enjoyment for them, me on my knees watching the oven and praying for the soufflé to rise! So the weekend before Christmas I’m making the cake and testing soufflé recipes, I actually enjoy this day because it starts to build all the excitement for the day itself. Anyway, back to the Christmas cake and how everyoneʼs is different, I donʼt like to ice mine, mainly because I donʼt have much of a sweet-tooth. I know some people are thinking, well that is just a fruit cake, but I love it with a cup of tea and donʼt want anything overly sweet. If I was to make a Christmas cake at work I would ice it, as they can look stunning, with their beautiful white icing and decorations. They sometimes look so good that no-one wants to be the first to cut into it, sometimes the chef will have to leave the kitchen and cut it first just to show people itʼs ok to start eating it! 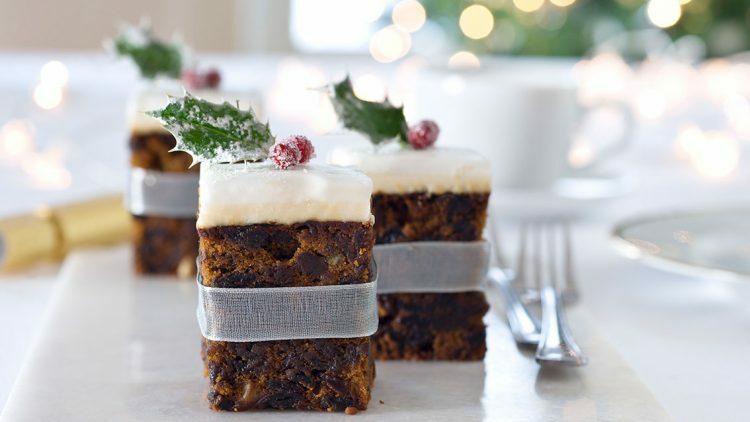 Here are my handy tips to make the perfect Christmas cake. 1- Make the cake the week before Christmas and store it in an airtight container, feeding with whisky or brandy every couple of days. One of the main reasons for making it the week before is, it takes the pressure off you leading in to the Christmas rush. 2 – Have an idea of how you are going to decorate your cake and buy everything well in advance, the last thing you need is having to run to the shops halfway through! 3 – Allow yourself plenty of time, it can be made in advance and stored in an airtight container away from bright light. Look on the internet and social media for ideas of how you are going to make your cake stand out, there are so many great ideas out there. 4 – Buy the best ingredients you can afford, it will make a difference. If you donʼt have one already, look into buying a good quality baking tin, it makes a massive difference and is more enjoyable to work with.